Efforts continue to contain the Rainbow Point Fire within the Kisatchie Hills Wilderness. Numerous firefighters and equipment including a helicopter have been assigned to the incident. 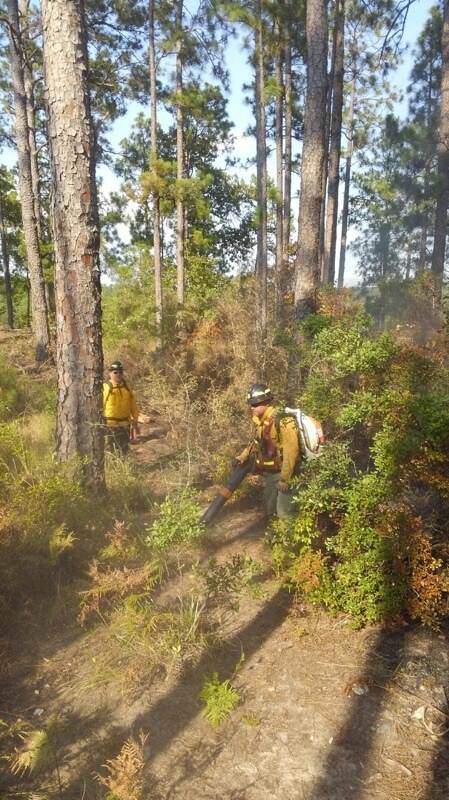 The incident objectives include providing for public and firefighter safety, protecting private residences and timber lands and containing the fire in a small area with secure boundaries within the Kisatchie Hills Wilderness. “I feel the firefighters are doing a great job towards containment of the fire. I want to thank the visitors and local residents for the great cooperation the firefighters have experienced,” said Acting Forest Supervisor Marcia Pfleiderer. The wildfire is burning in a steep, rocky area which is unusual terrain for Louisiana. “The Kisatchie Hills Wilderness is truly different from any other place in Louisiana. Fighting fires in the steep, rocky, brush country can be very difficult,” said Ranger Mike Dawson. The Kisatchie Hills Wilderness and associated recreation sites and trails remain closed. The public is asked to drive with caution and to be aware of emergency vehicles and firefighters staged along the Longleaf Trail National Scenic Byway. Recreation sites and trails outside of the Kisatchie Hills Wilderness remain open. For more information on the wildfire or about the Kisatchie National Forest, please contact Jim Caldwell (337-353-4668), jcaldwell@fs.fed.us or Stacy Blomquist (318-446-5054) sblomquist@fs.fed.us. An aerial view of the Kisatchie Hills Wilderness during a wildfire. Firefighters painstakingly create a fire line by hand to contain the wildfire in the Kisatchie Hills Wilderness. A helicopter transports water to the Rainbow Point Fire in the Kisatchie Hills Wilderness. Next articleBILLY DEAN ELLERBE SR.